Of all of the memories I have of my Grandma throughout my childhood this step stool seems to be in every picture I have of her in my mind. She will always be sitting on it, by her kitchen stove, whether a fire was burning in it or not. I had a pretty cool Grandma, she had herself the very first Nintendo and she and I went through and beat the very first Zelda multiple times one summer when I was 11 years old. She hand drew maps of all of the dungeons – seriously though, how cool is that?! I went looking for those old maps years ago and could not find them but still think of them from time to time. This old step stool, if Grandma wasn’t sitting on it her kitchen, I was! It was my favorite spot and when Grandma passed and this became my home this stool was with me throughout the entire renovation. It was already very old and not in the best of shape and us using it – me standing on it while drywalling or running electrical or plumbing, did nothing but just make it more rickety. By the end of the renovation this poor old Cosco step stool was not safe to use anymore! So, I stashed it in the garage for a day when I knew I could bring it back to its former glory. This weekend I rolled up my sleeves and got to work! You can see in the picture that the step stool was absolutely filthy so I brought it inside, set it on a towel by my kitchen sink and mixed water and vinegar in a bowl and got to scrubbing. Is that a big nail being used to keep the back left leg attached to the stool? Yes, yes it is. Once I got the entire stool scrubbed down I headed out to the barn for a bolt and nut to replace that old nail. I removed the last two rubber feet that were still holding on and the (very old) black electrical tape that was being used as a foot. I went through every bolt and nut and tightened the entire stool down besides replacing two of them that were missing. Amazingly, the stool became sturdy again and was just as good as new except, of course, it really need some paint! I bought one can of Rustoleum black matte spray paint and one can of Rustoleum’s chrome spray paint and took my stool outside for painting. I painted the “steps” first with the black matte paint and then taped them off and painted the rest of the stool in chrome. That chrome spray paint is AMAZING! It’s like liquid aluminum foil! The seat was in terrible shape, the rings you see there are from PVC primer where this stool had joined me running all of the drains throughout the house. It needed to be replaced and I couldn’t think of a better replacement then red vinyl! Inspecting the underside of the seat I saw four steel tabs that were bent over, straightening them out I was able to pry the seat right off! 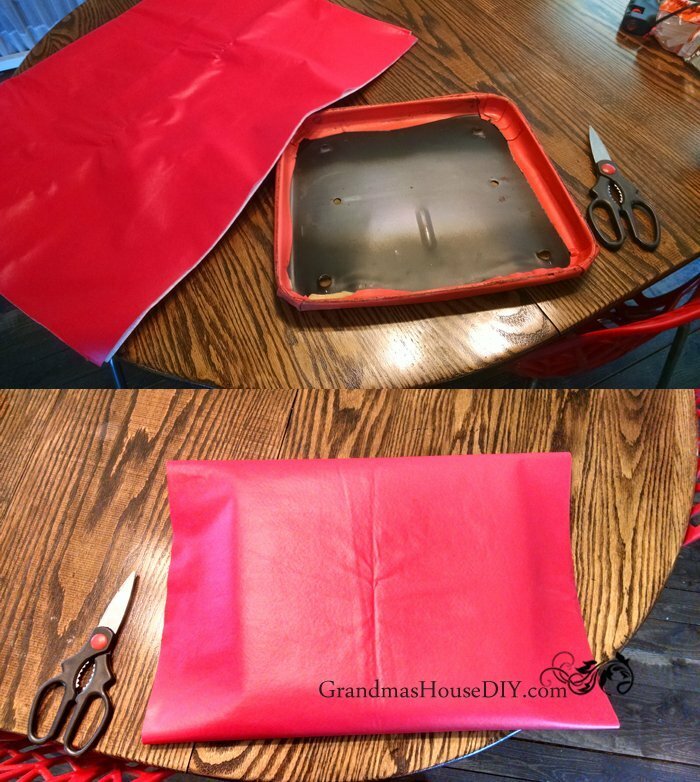 I grabbed my glue gun and some scissors after seeing that the old seat cover had also just been glued down. I ripped the old cover off and replaced it with my new red vinyl and found myself in a predicament. Shoot! That’s a really ugly wrinkle! I did some searching online and tried getting the wrinkle out by drying it in my dryer for half an hour – that didn’t really work, it helped, but not good enough. My mother-in-law had bought us a little hand steamer for clothes and that worked! With the paint dry I brought the stool in, put on the new feet I bought for it and TADAH! 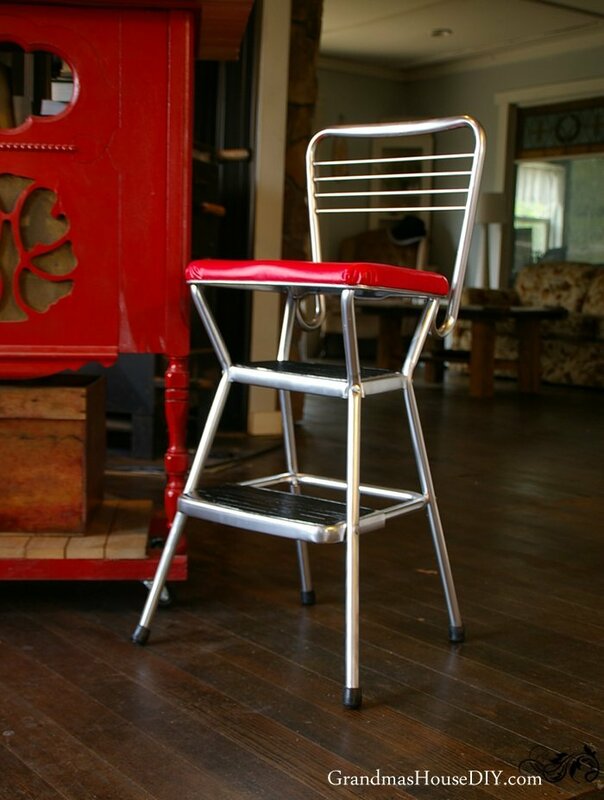 I’ve already used this stool several times in my kitchen to reach the top shelves of my ceiling-height cabinets! It is just wonderful! And the whole cost only came to $12! I love that it is back where it belongs, I literally set it down in the same place where it always was before, in my Grandma’s kitchen. Things are a little different then they were back when this was her place but, to me, it is still the same place. Sometimes, I swear, for a split second when I run up the front steps and through the same screen door that was there when I was kid, I’m literally 11 again and I almost expect to see her sitting right there on that stool waiting for me. This is the sweetest post! 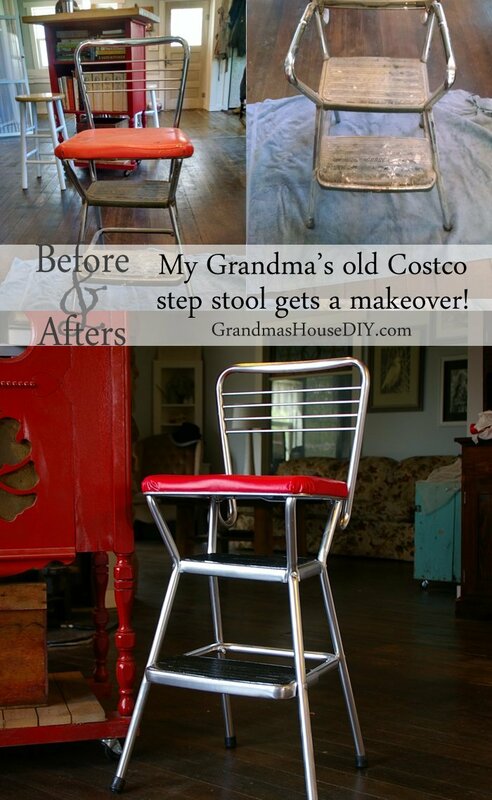 Your grandma absolutely sounds like the coolest, and you’ve done an incredible job restoring her old stool. It looks amazing now! I have two of these stools in my possession. One is in better shape than the other but the price was right on both. I think your makeover is awesome. My stools do not have the sentimental value that yours does but I would love to make them over and bring them back to life. Hello! I have been on the lookout for another one just like this one so we can have two matching stools in the kitchen but I haven’t been able to find one yet! Thank you! Oh, Tarah. You made me cry again. When I go up those same old steps and through the same doors, I expect to see the house they way it was and both Mother and Dad there waiting. So touching, what you wrote, and how you redid Mother’s old stool. Love you, Ta. Oh Sharon thank you so much! 🙂 Love you too! And can’t wait for you to see it! I remember back in the day every well equipped kitchen had a stool like this. Actually there are times I could use one now instead of standing on the counter trying to clean the top of the cabinets. Bad me right? The stool looks fantastic. Gorgeous! BTW I hate to sound like a jerk, but the brand of chairs and stools is Cosco, not Costco. I remember noticing that on one my mom had. 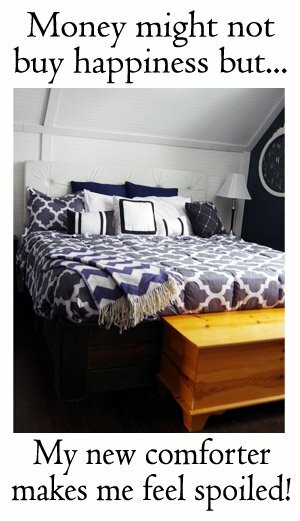 I love your blog and am super impressed by all the renovations you have done. Good work! Loved hearing the history of this stool. The makeover is super! Diana, what a wonderful memory 🙂 I love that I feel close to my grandma often when I’m here, sometimes I’m literally sitting on the same stool in the very same place she used to hang out every day. Thank you for sharing your memory and for stopping by! I did the same thing!! I used turquoise for my seat, but I loved how it turned out and especially all the memories those stools hold. Thanks for sharing your story! Pamela, that’s wonderful! I’m thinking of getting another to match! Thanks!! Items that have a treasured memory attached are the best. What an honour it is to redo that stool and share with the world how wonderful your grama was. I bet she is smiling. Beautiful job. wow! That is a huge transformation. I am so pleased that you have your grandmothers kitchen stool and have those memories come to mind every time you use it. Great job! It turned out great! What a wonderful memory you have of your grandmother and that stool! Beautiful transformation! Thanks for sharing on the Pleasures of the NW DIY party! That is an amazing makeover and I love how you went with the original style, it looks fabulous! Looks great now! Thank you for linking up with us at #HomeMattersParty .See you again next week. Thanks Sahana, see you next week! My Grandmother had a yellow one that I inherited when she passed. It has been sitting in my garage for years and now you have inspired me to refinish it. Many talks took place on that old stool and I always think of her when I see it. You did a great job and I’m sure your grandmother is smiling down on you. 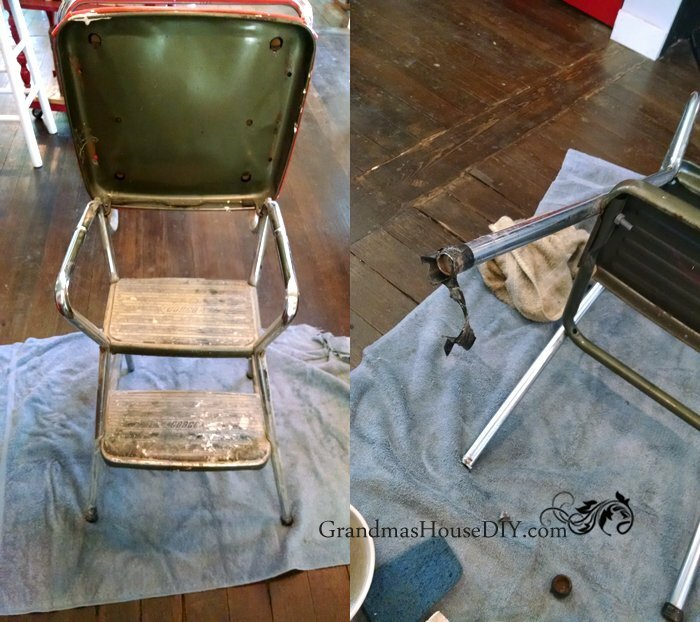 Its so cool to hear similar stories about grandma’s and their stools 🙂 I never could have given this one up and I was SO relieved when it wasn’t beyond repair! Tarah, what an awesome job. How special to refurbish and bring back to life your grandmother’s stool. Your make~over turned out great. Thank you for sharing at Your Inspired Design. Thank you Diane and that is SO true! What a great new look from the old stool! I keep my eye out for one like my Grandmother had. I would love to have one for my granddaughters! You did a great job! What sweet memories and a lovely, treasured stool. Congrats, you’re featured this week at the This Is How We Roll Link Party. What a sweet transformation. The stepstool looks so much better now. My MIL is always complaining that she can’t find a stepstool as good as the one she bought 30+ years ago. It’s good to know that I can fix her old stepstool up if I need to. Love this! 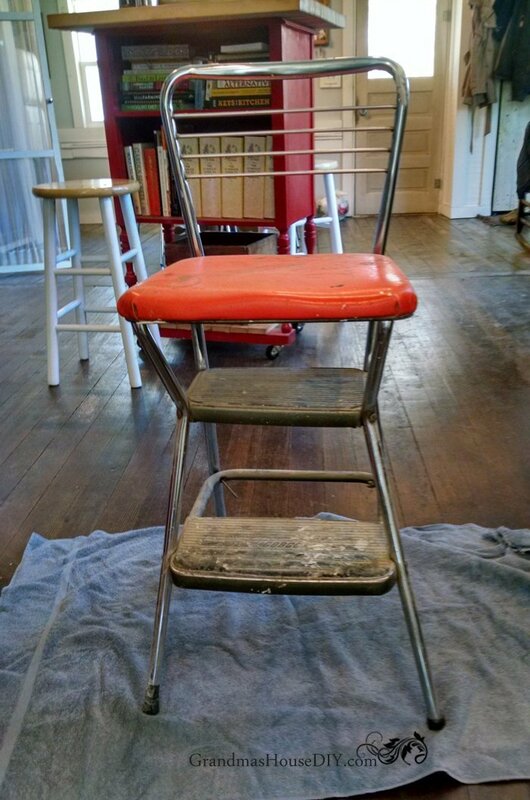 My mom had a similar stool, and I used to sit on it while I dried dishes, and told Mom about my day. What a wonderful memory Deborah! Thank you for coming by! I have my husband’s grandmother’s stool that is just like yours only yellow. We had to take ours apart and now it looks so much better. so many great memories of it in her kitchen. She just turned 101 last week. Wonderful you kept her stool too! My grandma’s sister is turning 103 this year! That is a good thing 🙂 I seem my grandma in my hands, they look so much like hers and more so every day lol I think about that sometimes, all the wonderful work she did here on the farm and now here are my hands doing the same things, pretty cool and wonderful to have good memories! 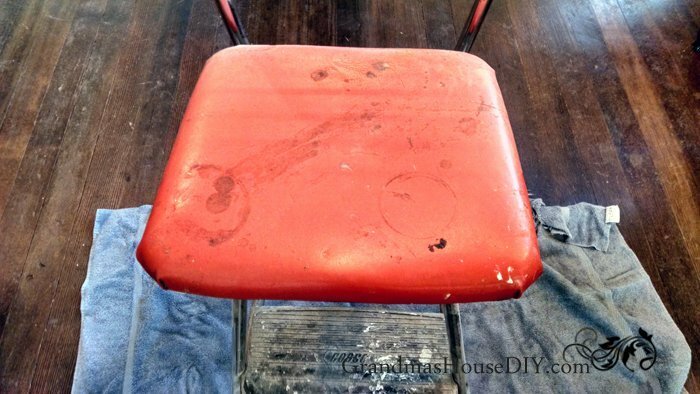 Great job on this stool and so fantastic that you’ve preserved it for at least another generation or two – they’ll have their own memories of you, now. Thanks for bringing this by Throwback Thursday and Happy Thanksgiving! Thank you so much Mollie, I’m so glad I was able to save it! I have an old Cosco stool that I need to makeover. Yours is incredible. Great inspiration! Thank you for sharing at the Snickerdoodle Create~Bake~Make link party! 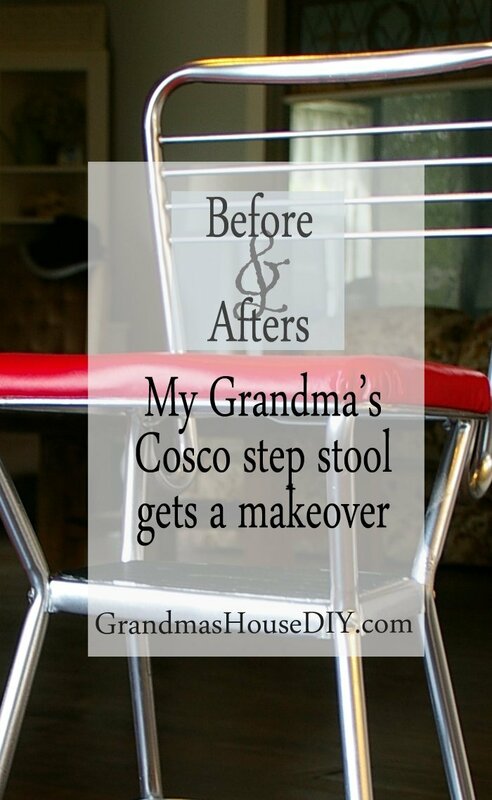 I am featuring your Cosco stool makeover to day. 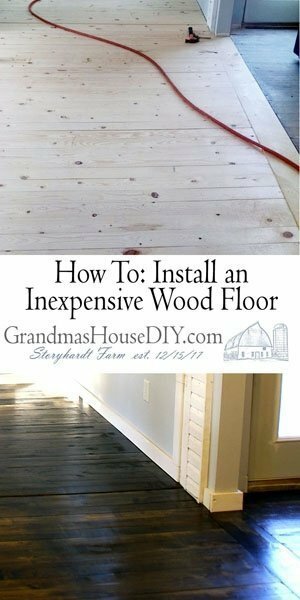 Another fabulous project to revitalize a tired step stool. My mom still has one of these stools!! I bet I could make it look so much better!! Thanks Jodie for coming by! Thank you 🙂 it really holds a lot of memories for me! 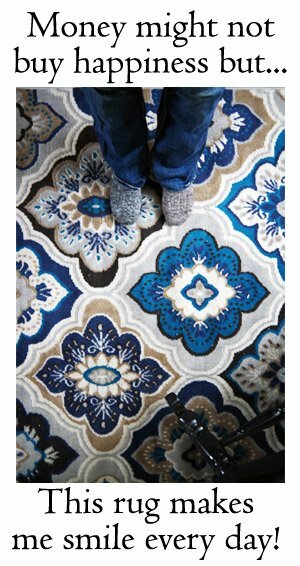 I love the transformation and so fun it will always remind you of your Grandma. Thanks so much for sharing at the Friday at the Fire Station link-up! I love that you revamped this beautiful family stool! Love it! We had a stool like that growing up. Wish I had it now. Your transformation looks awesome! Saw this on the Reader Tip Tuesday link party – thanks for sharing! Awesome makeover! Now I know what to do with my old rusty stool. Thanks for sharing it with us at the Waste Not Wednesday link party. Keep coming back and linking each week. Thanks for coming by, have a great weekend! Great job, Tarah! I love it, and I know your grandma would too! What a wonderful makeover though it seems more like a rebirth. Thank you so much Miriam, have a great week! Oh thank you so much Angie! That’s a great makeover. Growing up I remember my mother had a similar step stool in her kitchen, but I think we got rid of it years ago…Than you for sharing at The Really Crafty Link Party. Pinned! Thanks for coming by Teress! I love my old stool, so glad I was able to save it! Thanks for coming by, have a great week! I have a vintage Cosco stool that is pretty beat up. I love how yours turned out. Question: how do you suggest replacing the black treads on the steps? I’d like to keep to the original look as much as possible. The ones on my stool are unsalvageable. Hi Hunter, I would suggest looking into the thin black, rubber mats/rugs at Walmart, you may find something really similar for the treads that you can gorilla glue down! Thanks Tarahlynn…would they also have replacement ‘feet’? Hi Hunter, yes I purchased replacement rubber feet from my local Ace hardware store! I have found a stool online– exactly like yours. I was wondering, how do you use the top step? Does the seat fold back? I have only seen the ones where the step ladder part folds out, so wasn’t sure how these type work… After seeing your transformation, I definitely must make a trip to buy that treasure!! 🙂 Thanks for sharing! Yep the seat folds up to reveal the steps! I’ve actually been looking for another one so I could have a matched pair but they’re hard to find! Wow!!! I have been trying to find find something like this. I wish I had seen it sooner!! (It took me a while to figure out what words to search.). So glad you found it Suzanne! That stool will be with me forever, I just love it! Love giving new life to things. I had one in the late 60’s that had a yellow seat. I got rid of it and regretted it later. Last year I found one at a thrift store that was in bad shape but after I finished it looks great. Recovered seat in white( already had the vinyl) so cost nothing. Thank you Nancy! I looked high and low for a stool just like it for a pair but I never did find it unfortunately. I use it practically every day!